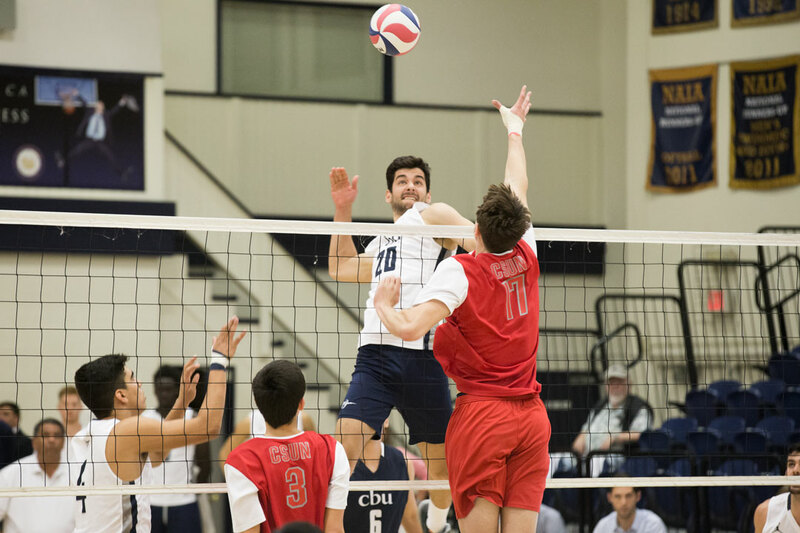 Enrique de Diego Garcia, sophomore business administration major and middle blocker, has had an incredible season with the men’s volleyball team at California Baptist University. Garcia has won multiple accolades during this season, as he was named the first American Volleyball Coaches Association Player of the Week, Mountain Pacific Sports Federation Player of the Week and the Altura Credit Union Athlete of the Week. Some of his statistics include an average of 2.53 points per set and a hitting percentage of .531. Garcia said he feels great about his achievements. Hailing from Madrid, Spain, Garcia explained that European volleyball is not entirely different from volleyball in the United States. He said the rules and concepts of the game are the same in Europe and the United States. Garcia said his goal this season is to be able to make the playoffs. Derek Schmitt, head coach of the men’s volleyball team, said Garcia is a great asset on the team. Schmitt also said the team counts heavily on Garcia for wins. Garcia will keep training for the team in hopes of qualifying for the postseason. He and the rest of the team will be on the road competing for a spot in the postseason and will be in action at home again March 30 at 7 p.m. against University of California, Irvine.